E-Collar Technologies Inc. is a group of experienced remote dog training professionals. 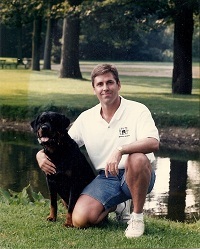 Top Dog, Greg Van Curen was the co-founder and President of Innotek, Inc. in the 90’s, his insight into the e-collar business has brought many innovations over the years. Kim Westrick, Innotek's and E-Collar's first employee is leading up the sales and customer service side of the business. We are the innovators of using low level stimulation to condition dogs to obey without the use of high levels of corrective stimulus. Our remote dog trainer collars are specifically designed to give a precision blunt level of the stimulation with predictable results. Our proprietary stimulation circuitry, which mimics a human muscle stimulator, has been proven to improve the effectiveness and reduce stress on the dog and owner during training exercises. Combine e-collar training with plenty of positive reinforcement making training your dog a pleasurable experience. We are driven by our mission to provide the best product at the best price using Americans workers to assemble and test our products in the original Innotek building with a long term goal of doing all our manufacturing in the USA. By purchasing from us you are helping Americans get back to work and we thank you for your business.